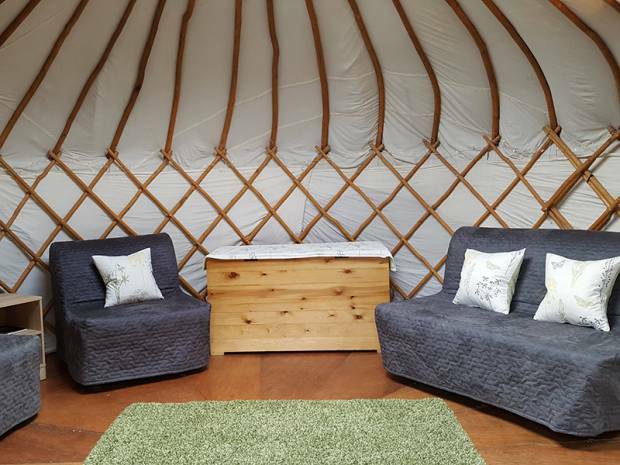 Our yurts are situated at Sneck Yeat, Brandlingill in a quiet field on a traditional working family farm surrounded by beautiful landscape. 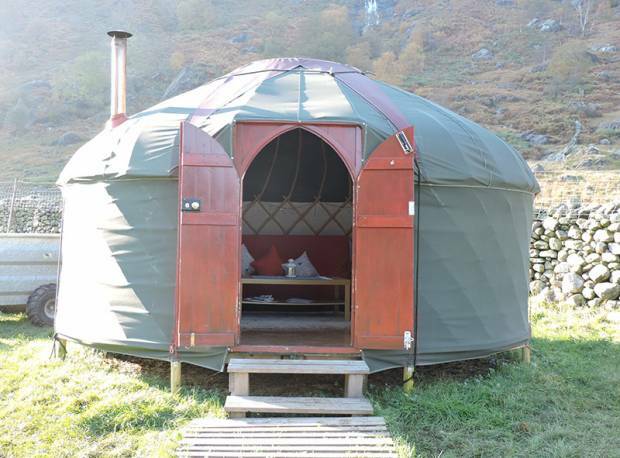 This is a 16ft yurt made by a local yurt maker here in Cumbria, using coppiced hazel wood for the frame and a polycotton cover, making it cosy inside and strong enough to endure whatever lake district weather comes along! It has wooden floors and a central skylight for star gazing in bed! A modern and comfortable double sofa bed and two single day beds (with floor space for fifth person on a camping mattress) which provide seating in the daytime. Goose down duvets and pillows and freshly laundered bedding. Fully equipped kitchen area with everything you need to self cater comfortably including gas hobs and grill (calor gas included). Wood burner (basket of logs included for a cosy nights stay)​. Solar powered lamp and fairy lights to give a magical feel. Tea, coffee and hot chocolate. There is an Eco toilet block and an Eco Shower block within the camp field located in close proximity of the yurts. There is a designated toilet and shower for each yurt. 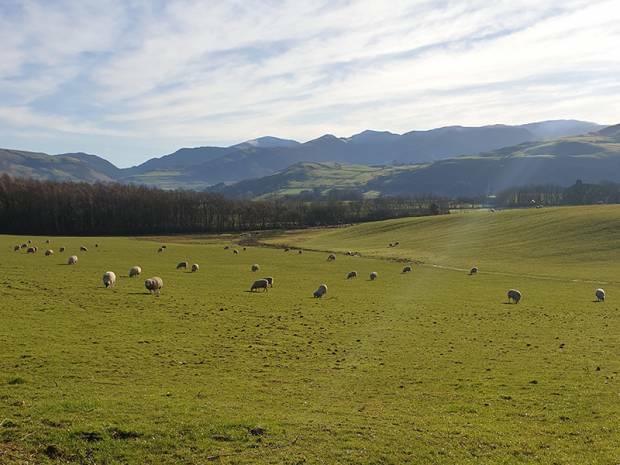 Sneck Yeat Farm is located 10 minutes drive outside of Lorton, 15 minutes from Loweswater, 8 minutes from the town of Cockermouth and 20 minutes from Keswick. A brilliant location and base camp for visiting the great sites of the Lake Distirict or even setting out for a walk, with out being to isolated or cut off and with the benefits of a beautiful, quiet area. 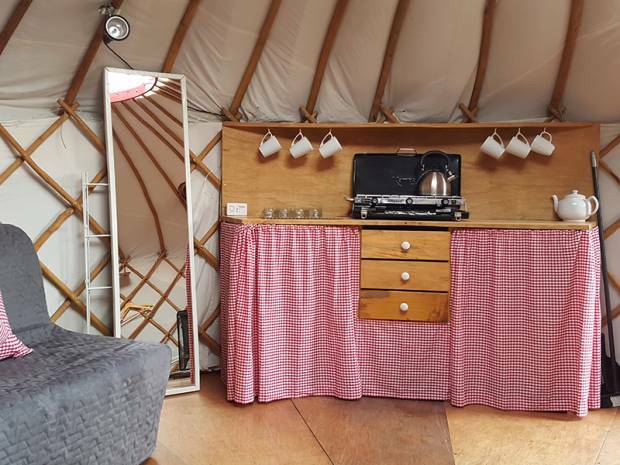 The Yurts are available from April to the end of October for season 2019. Minimum two nights stay. Check-in after 4pm on arrival date. Check-out by 10am on departure date.